Matthew Bible Memory Cd: Our Bible memory CDs are designed with Children's Bible Quizzing in mind. Whether the songs are a capella with beautiful harmonies, silly voices, incredible percussion, or full instrumentation, the kids will have a blast learning God's Word and have it hidden in their heart for years! Each Bible memory CD contains the required memory verses for Children's Bible Quizzing published through Wordaction. They are also great tools for Children's Church, Caravan, VBS, Sunday School, Camp, or just at home! 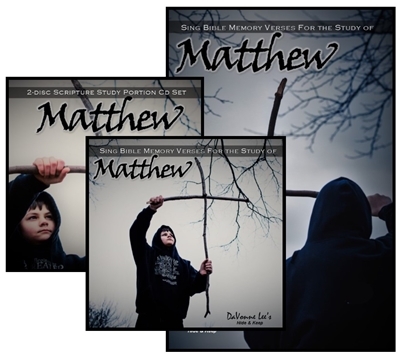 Matthew Scripture Study Portion 2-Disc Set: This 2-disc set is ideal for Auditory learners or young readers! DaVonne reads all Scripture portions used in the Study of Matthew, published through WordAction. Each track is exactly what the children will be studying from and quizzed over in Dig Sites 1-20. MatthewTeaching DVD: Perfect for teaching Visual and Kinesthetic learners!! In this DVD, DaVonne gives tools to help memorize the verses on the Matthew CD by using fun actions, great rhythm, and simple sign language. The format is: show, teach, show: The kids demonstrate -DaVonne teaches - then you join along!